Despite being a few weeks pregnant and heavily nauseas, I thoroughly enjoyed our trip to South and Central Vietnam. 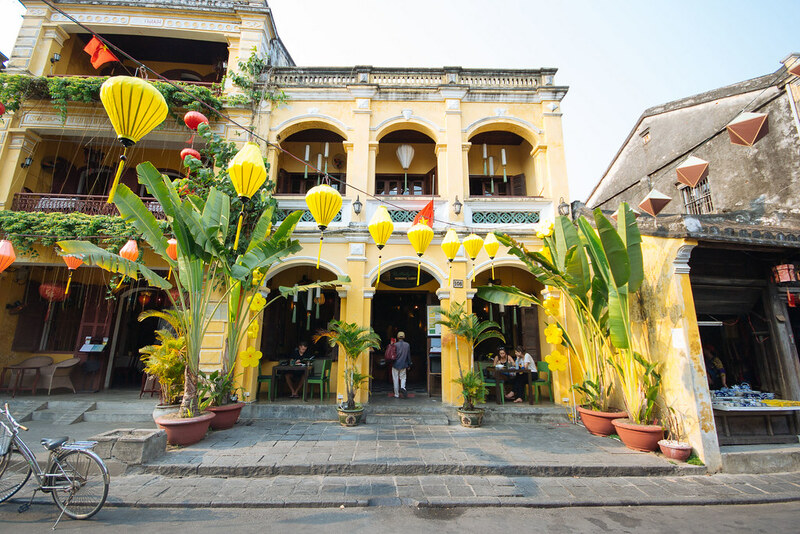 Everything from the vibrance of Ho Chi Minh and it’s people to the artisan hub of Hoi An makes it a country I would return to in a heartbeat. For me, the people of a country can either enhance or dampen your experience when visiting. Having lived in various parts of Asia for nearly 5 years, I can honestly say that the Vietnamese are some of the friendliest people in Asia and really brought such warmth to our experience. 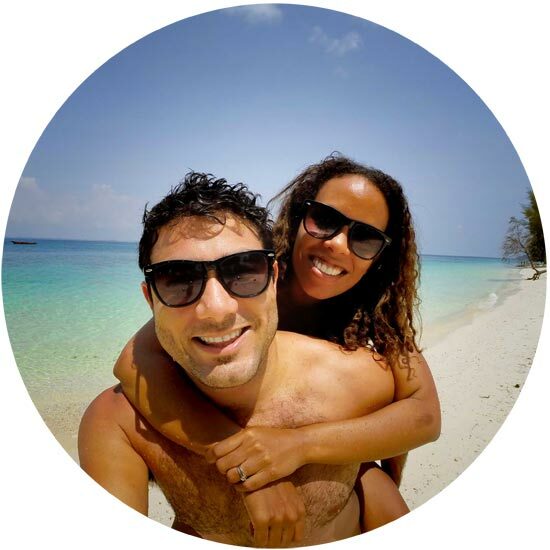 We were definitely not as adventurous on this trip as we usually are and took it quite easy due to my pregancy symptoms but here’s a few things we would definitely do again and some things we’d happily skip. Many people hop, skip and jump through Saigon looking forward to their next stop, but I really would not have minded staying longer than two nights in the city. Yes, it’s a big, bustling city with more scooters than the population of my home city, Cape Town, but it’s a vibrant one with urban dwellers who love their leisure time and stay active in their green spaces. Walking in the parks in the morning and early evenings and you’ll find a myriad of people running, doing aerobics, playing badminton and games of their own- shuttlecock. A dancer based in rural Malaysia ( with no dance studio in sight), I relished the park at night. Hip hop crews came out to rehearse their routines with no music at all and only the sound of their instructor’s counting. A city where dancers rehearse in open areas is my kind of city. Notre Dame is meant to be an exact replica of the one in France and it was a spectacular sight to behold. 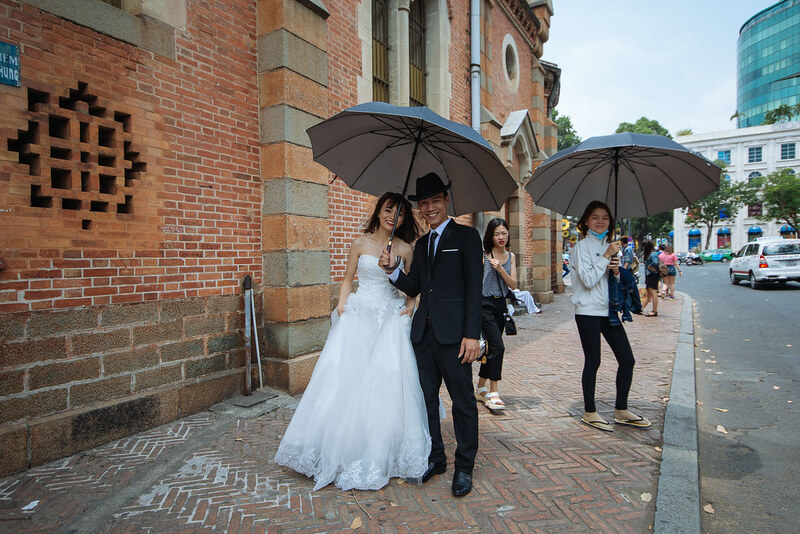 I especially loved the number of shoots and legit married couples posing before the walls to have their photos taken. 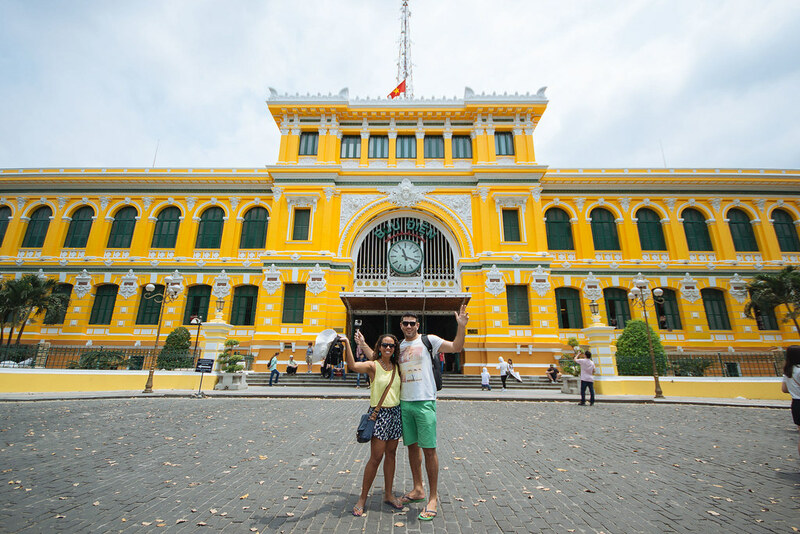 Another architectural beauty is the Saigon Central Post Office hailing from Vietnam’s Indochina period and combines Gothic, French and Renaissance influences. I loved the red telephone booths and the painted maps on the walls. Whilst the office is just a tourist attraction, you can ‘send’ postcards from here and do a bit of memorabilia shopping too. 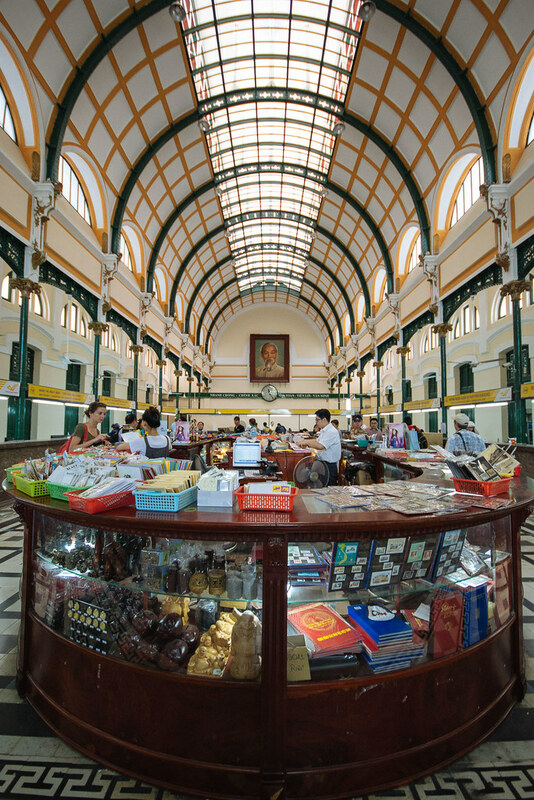 Along with its strong French influences, Vietnam boasts some can’t-miss bakeries. 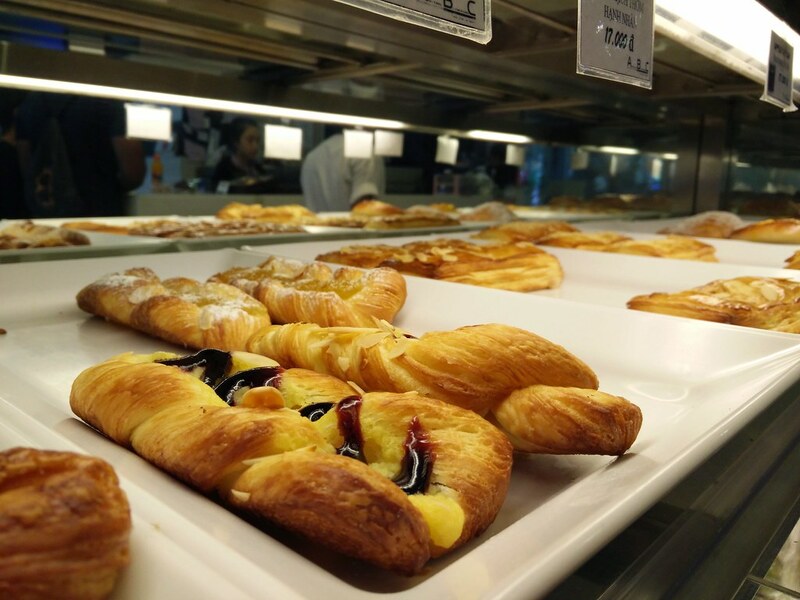 Finding good croissants, pastries, muffins, French loaves and breads in Asia is really like hitting the jackpot and you’ll find one on nearly every corner in the big city. 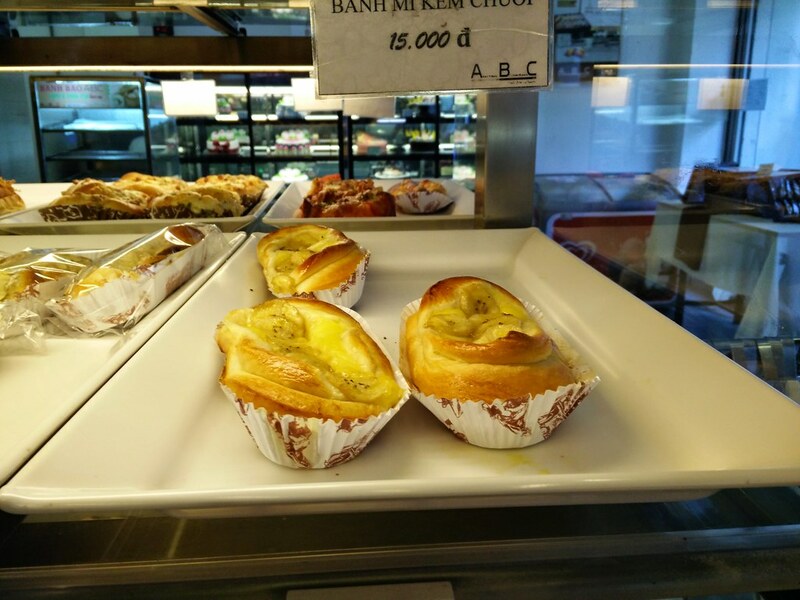 ABC Bakery was recommendeded to us and truly lived up to it’s sweet name. If I could’ve, I would’ve bought in bulk and taken all their chocolate croissants back to Malaysia with me. 2. Mekong Delta on a Vespa. 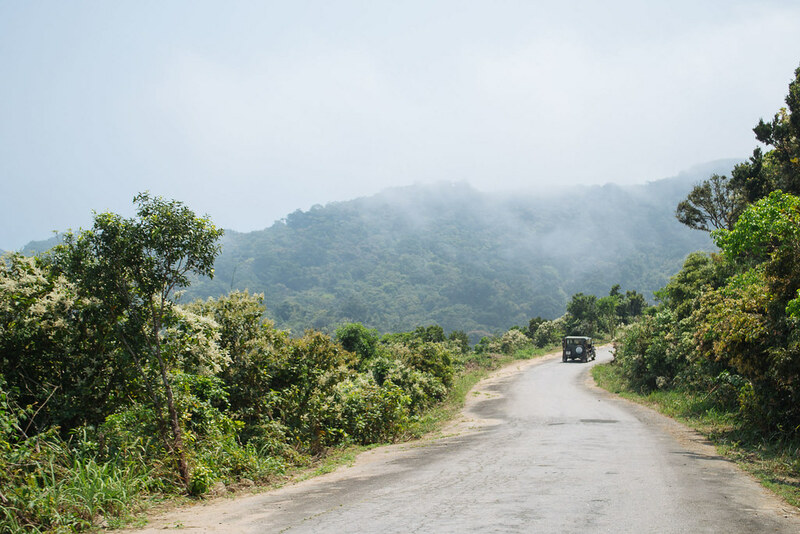 We decided to escape the city with Vietnam Vespa Adventures and head to the rural riverside community of the Mekong Delta. Even though Vaughan is an experience scooter rider, we were so thankful not to have to ride in Saigon. There seem to be more scooters than cars and constructive chaos abounds at each road crossing an intersection. We met at the Vespa Café for an introduction and delicious Vietnamese coffee before scooting off with their drivers at the helm. Everyone chose their own Vespa or scooter at the main hub outside of the city before heading to the Mekong. Trailing along dusty roads, we stopped at a shrimp farm, coffee shop, the freshest seafood market and took a scooter ferry across the river. We watched a woman making incense in her home, skinned frogs being sold at the market and vitamins fed to shrimp. Together with our tour group we ate dust, marveled at the richness of life fed by the river and ate magnificent Vietnamese meals at regular stops. Getting to experience life outside of the burgeoning city was really well worth the aching buttocks and just thrilling to see all from the back of a scooter. 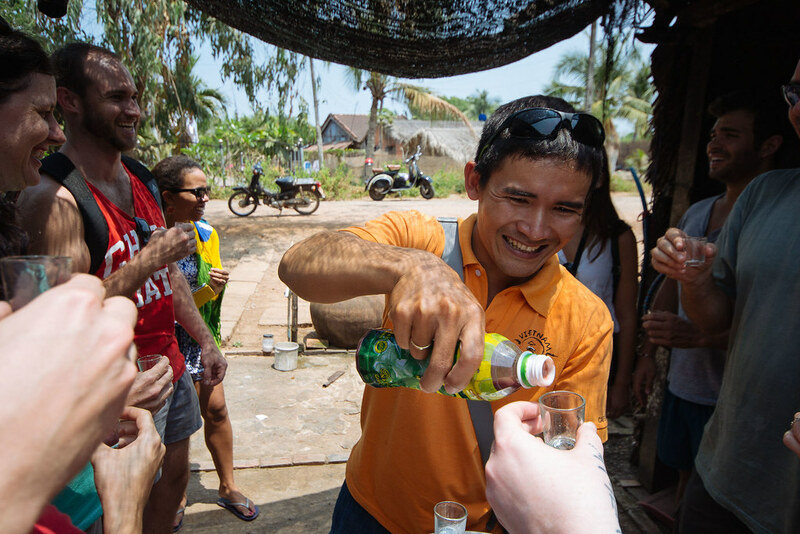 Time for some locally brewed rice wine! 3. 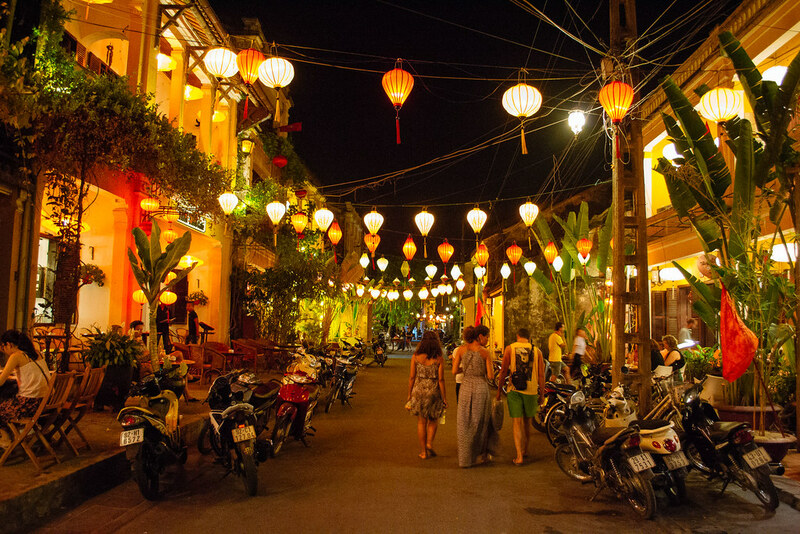 World Heritage City of Hoi An. As soon as we arrived in the little town of Hoi An, I instantly regretted not making this the focus of our trip. Locals and visitors cycled past roadside rice plantations, lanterns of every shape and shade hung between restaurants and women in rice hats paddled their passenger boats along the river. Every parked bicycle, every street vendor and each shop filled with art, clothing and lanterns begged to be photographed. Hoi An abounded with the very best of Vietnamese cuisine but there’s a reason Morning Glory was always full. Their spicy mango salads, cripsy bacon pancakes and every main meal we tasted was some of the best food we’ve ever tasted full stop. You can watch the chefs preparing certain foods in the open kitchen downstairs and together with the chatty, romantic ambience, we loved eating here with our friends. Morning Glory Restaurant – The beef salad is a must! We were told beforehand that Hoi An is the place to have clothing made, but we didn’t know just how many tailoring shops would beckon for business. Our UK friends gave us a recommendation of a shop they loved and we entered on one day and returned the next day to collect tailored linen shorts for Vaughan as well as a jumpsuit and dress for me. Pretty swift if you ask me. But remember to bargain and bargain some more before accepting the first and second price they give you. 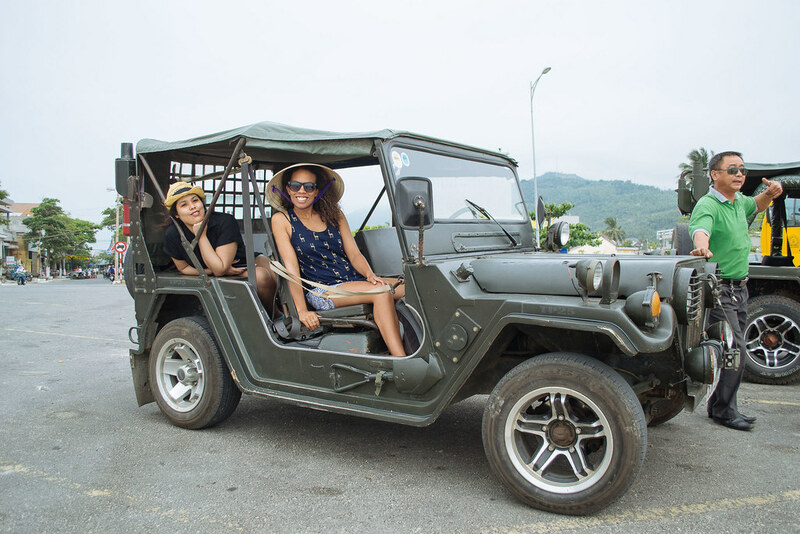 Hoi An to Da Nang Jeep Tour. 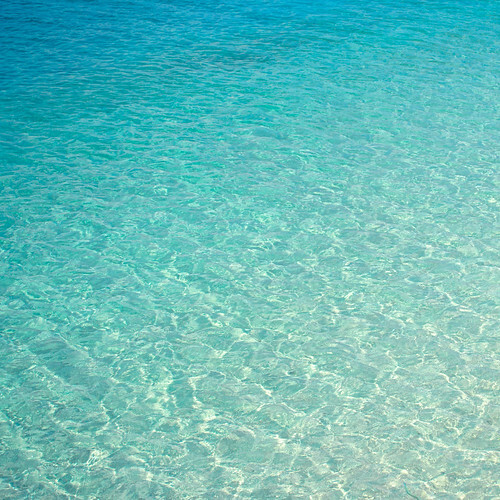 Travelling in a jeep along this scenic coastline is definitely something we would do again. Except next time we will insist upon having all of us travel together one group. Together with my cousin Amy, there were three of us and we were told that we had to travel separately in two jeep as the guide and the driver take up the front two seats. This was not ideal and it was only after our tour that we found out via the website that it was possible by allowing the guide to drive out front on a scooter. Another aspect of the tour we would’ve altered was the speed we went. We felt that the driver’s really snailed their way along the entire tour and in the interest of time, it could’ve possibly been mad shorter by an hour or two if we drove a little faster. 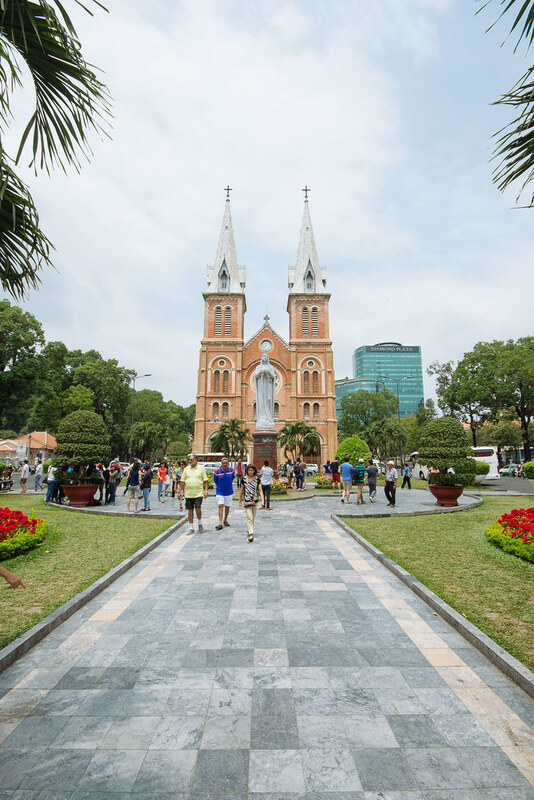 We loved that the tour snaked along magnificent Vietnamese coastline and include the the Son Tra peninsula, a Cham Museum and Marble Mountain. Enquire at Rose Travel Service about their Jeep Tours. Da Nang vs. Hoi An. 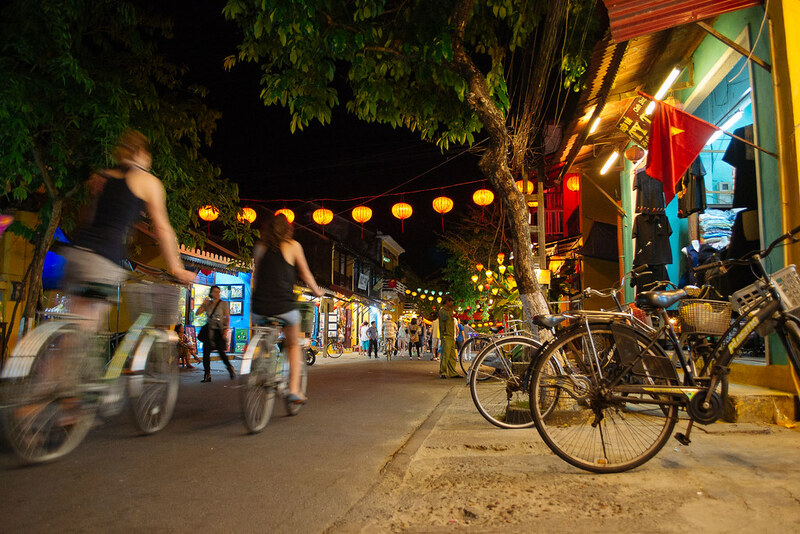 When it comes to dividing your time between these two towns, Hoi An really is a no brainer. 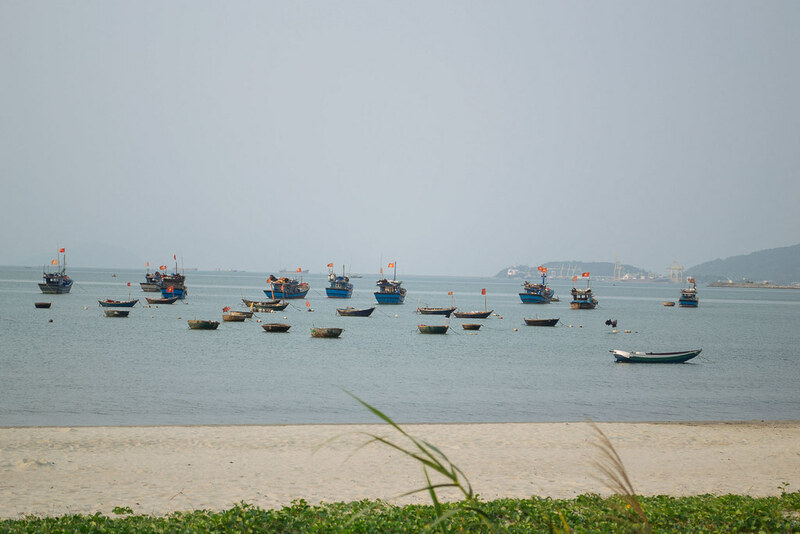 We wanted a quieter stay and an opportunity to see the less-visited Da Nang but aside from the beach and tons of seafood restaurants, there was nothing much there and not worth a three night stay. One thing we will definitely recommend you do if flying into Da Nang is staying for at least a night or two at Frangipani Boutique Hotel. a block or two from the beach. The owners Lee and his wife lovelingly run this little gem superbly and together with his parents, they’ve turned this house into a stylish home away from home. Plus the breakfast is some of the best you’ll find at a guesthouse or hotel in many parts of Asia. One of the best, absolute best guesthouse owner’s we have ever met. A tucked away Danang harbour. Hoi An Beach reconnecting friends that live on different continents! Beautiful day!